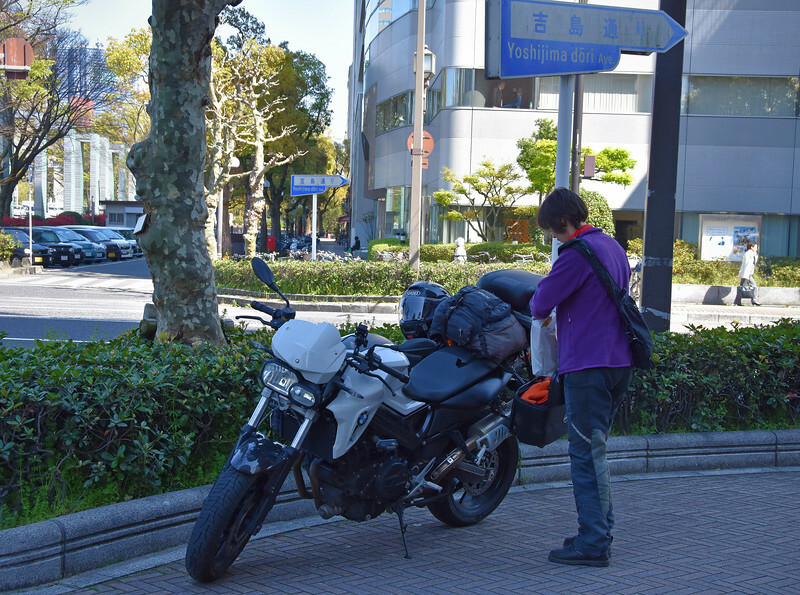 Our hostel sits right on Hiroshima Bay, and when we awake to pack the bikes, we are treated to the magnificent sight of the mountains of Noumishima peninsula just across the bay. 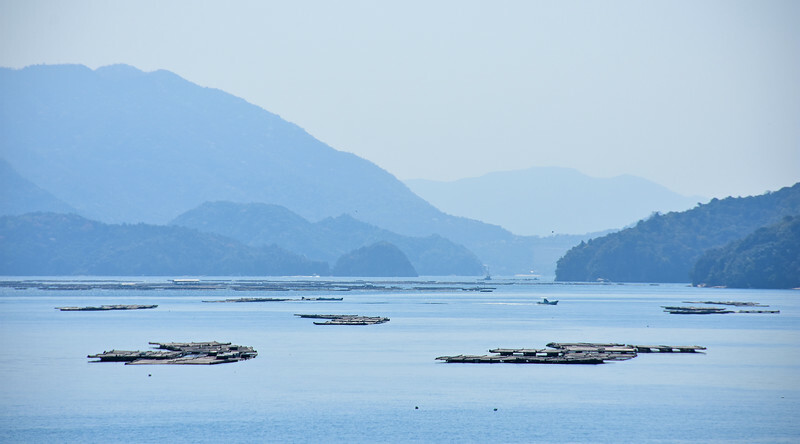 The waters in the bay are known for the delectable oysters that are fished off the coast. Today, we're riding into the city to spend the day at the Peace Memorial Museum. Most of our history of the bombing of Hiroshima and Nagasaki are written and retold through western textbooks and documentaries. 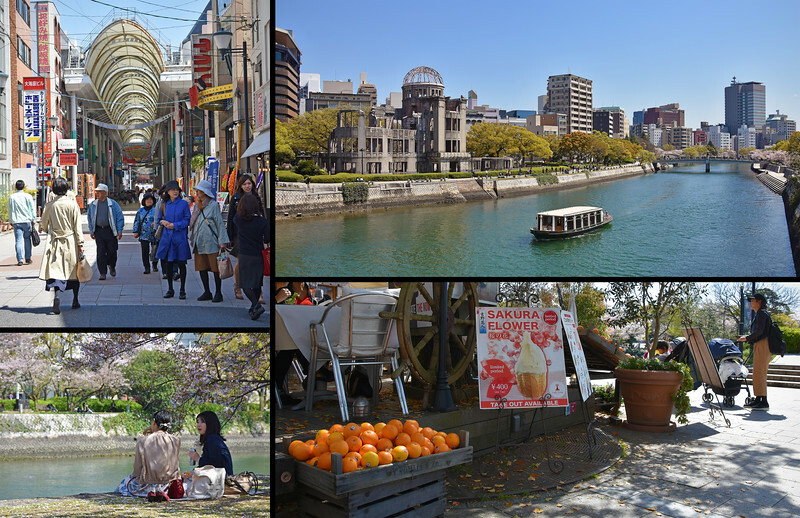 These accounts celebrate the tides of World War II turning when an atomic bomb was dropped on these two cities in Japan, demoralizing the enemy and ensuring victory for the allies. An interesting part of our trip is taking the opportunity to view history from the other side. In Cuba, we saw all sorts of government propaganda describing the Bay of Pigs from another perspective. It wasn't called the Cuban Missile Crisis in Cuba, and JFK wasn't wearing a cape either. 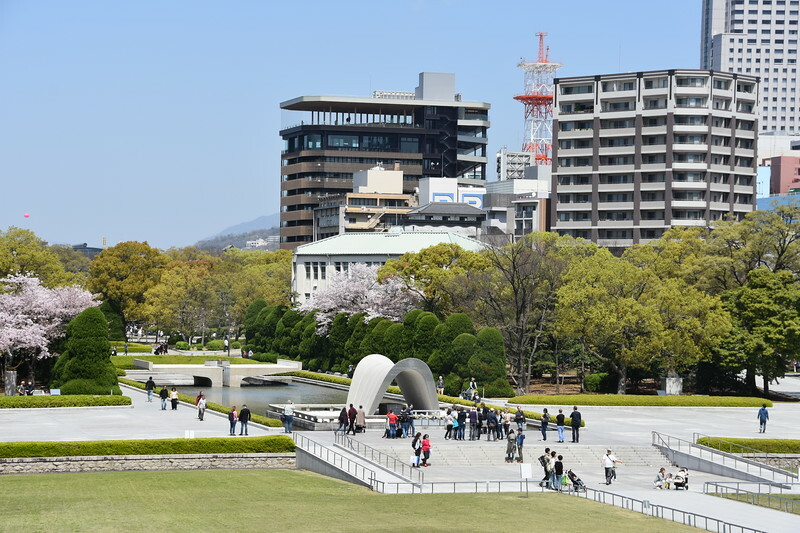 But here in Hiroshima, the Peace Museum offers a different agenda. There are no alternate depictions of heroes and villains, just the lives of ordinary citizens affected by the devastating effects of nuclear warfare. It doesn't seek to rewrite history, instead its mission is to ensure no person or country ever has to suffer death, destruction and "atomic bomb disease" ever again. Immediately inside the museum, we are greeted with a 3D map of the city. 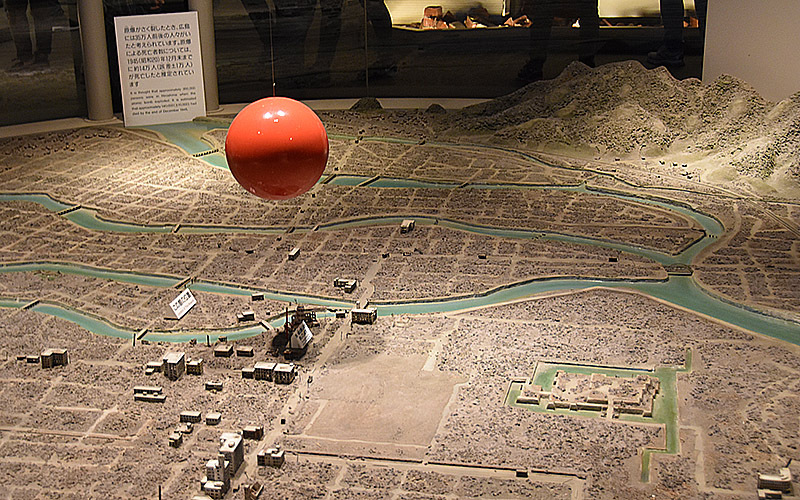 A red ball is suspended over the map. 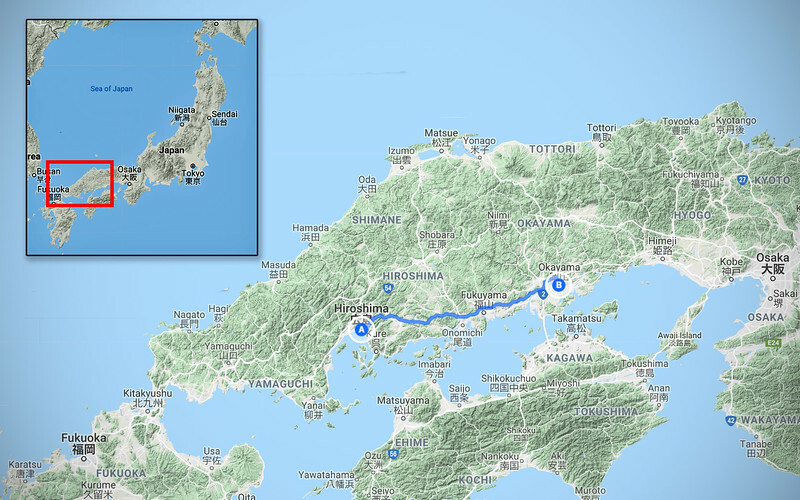 This is where the atomic bomb exploded, 600 meters above Hiroshima. One second after the bomb detonated, the ball of radioactive fire is already 280 meters in diameter. Each room in the museum showcases items like the surviving scrap of a school kid's uniform, burnt ID of a man going to work, a recording of the survivor's account of that day, reliving the searing heat of the bomb's blast, searching through rubble to find loved ones, all the while their limbs melting off their bodies like candlewax. Harrowing stuff. When I was in grade school, I read a book called "Sadako and the Thousand Paper Cranes". It was written by a Canadian author and was part of the elementary school curriculum in my district. The story was about a Japanese schoolgirl who survived the atomic bomb blast at Hiroshima, but later developed acute lymphoma 10 years later. 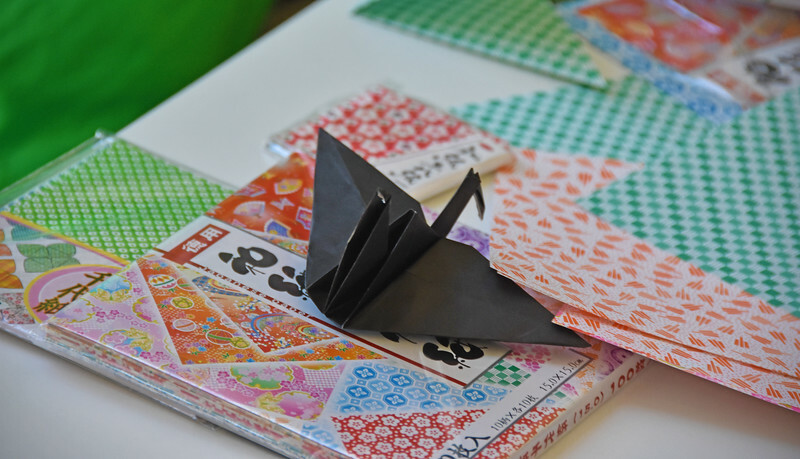 Sadako was inspired by a Japanese legend that claimed that if one folded 1,000 origami cranes, their wish would be granted. Her surviving family members say Sadako managed to fold over 1,400 paper cranes, but she died on October 25th, 1955. 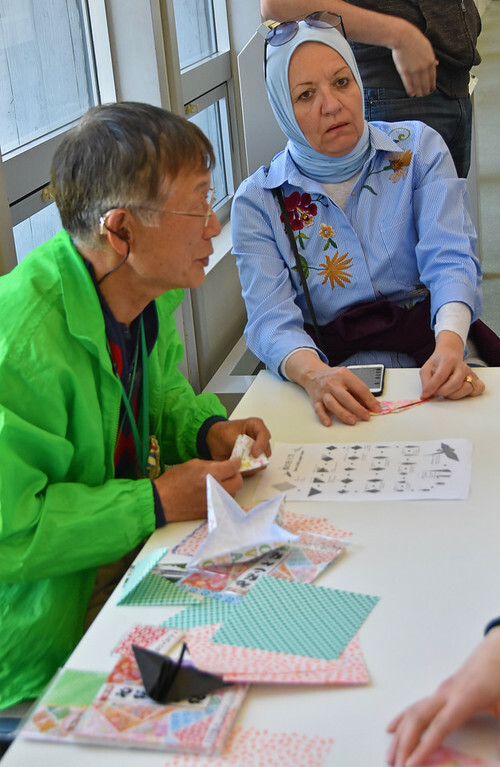 Sadako and her paper cranes have become an international symbol for the innocent victims of nuclear warfare. 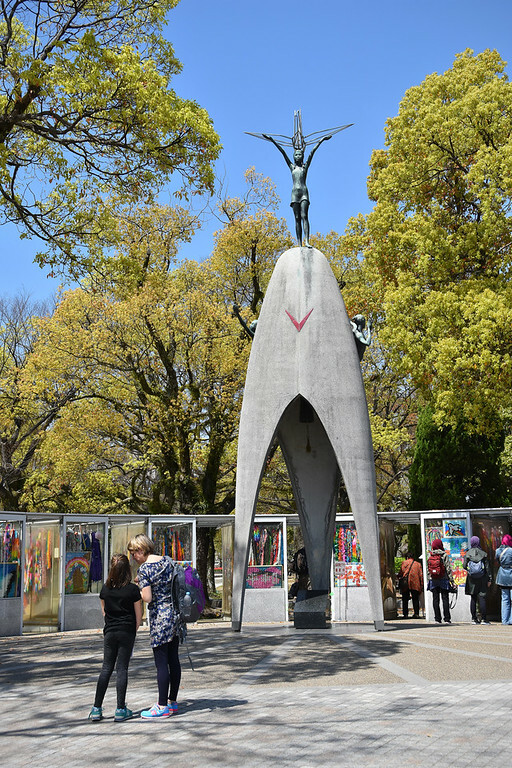 Sadako's classmates started a fundraising project to help build the Children's Peace Monument to remember her and the other children who died from the radiation sickness in the aftermath of the atomic bomb blast. 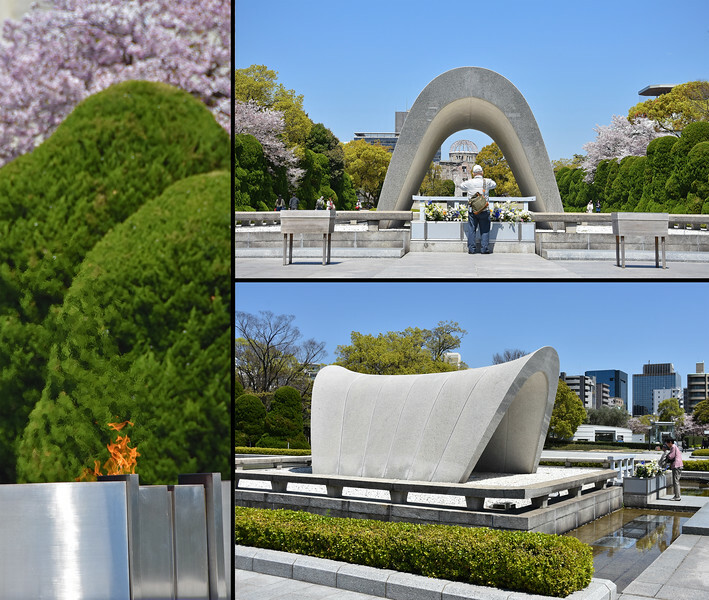 The Peace Flame has been lit continuously since 1964 and will continue to be lit until all nuclear weapons have been destroyed and the planet is safe from nuclear annihilation. This was pretty heavy stuff to digest. 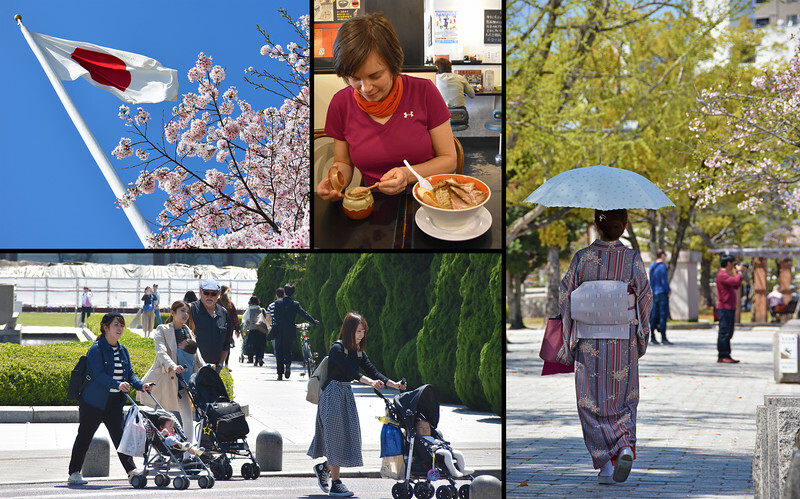 Thankfully, the beautiful sunny day helped to lift our mood as we walked away from the park and into the city. We had just relived the horrors of the atomic bomb, but for the people who live in Hiroshima, WWII ended over 70 years ago. 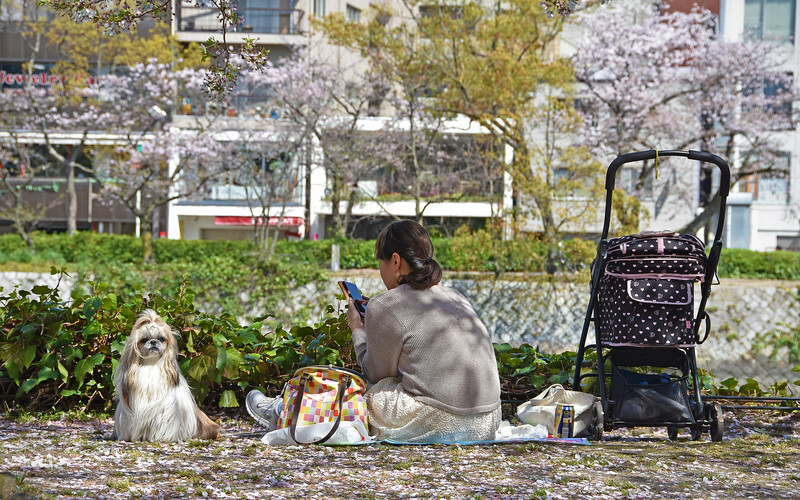 They had other things to do, like enjoy the sakura blossoming all around them. 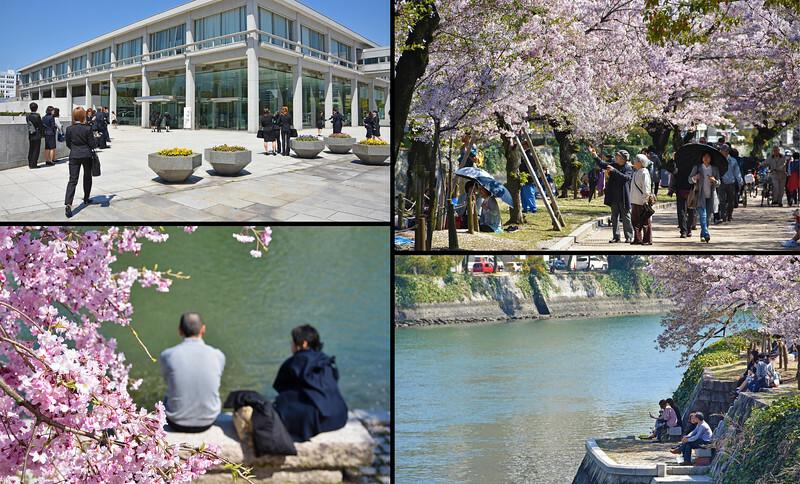 The neighbouring prefecture to the east is Okayama, also the name of the city. 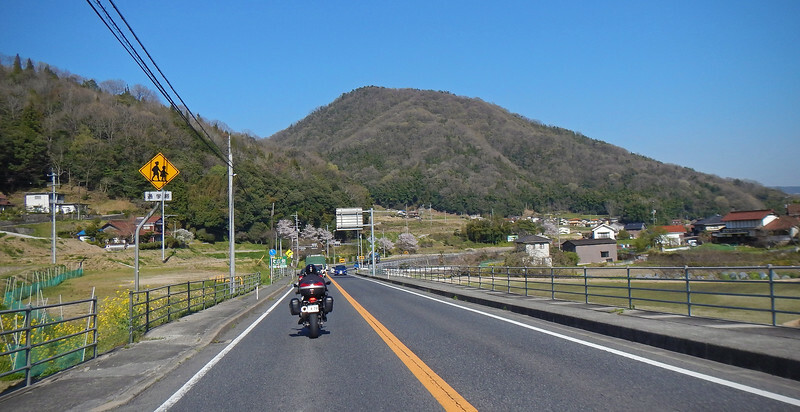 There is such a marked contrast between the emptiness of rural Japan and the congestion of the cities. 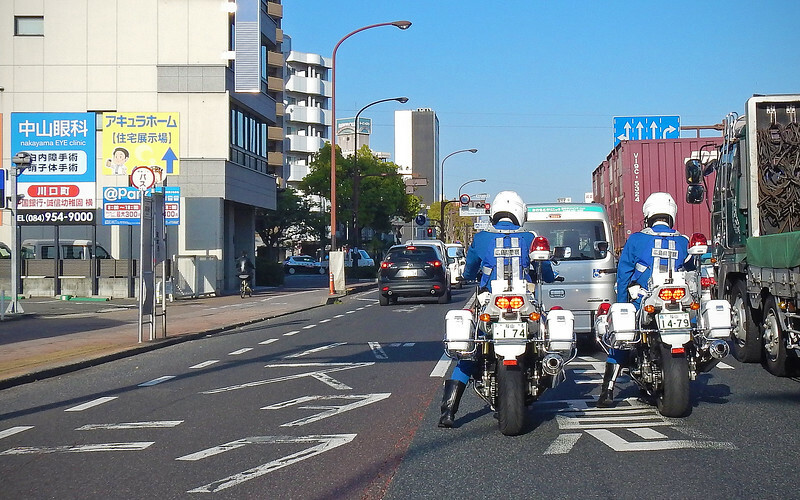 While driving through town, we pull up behind these two cool police motorcyclists. 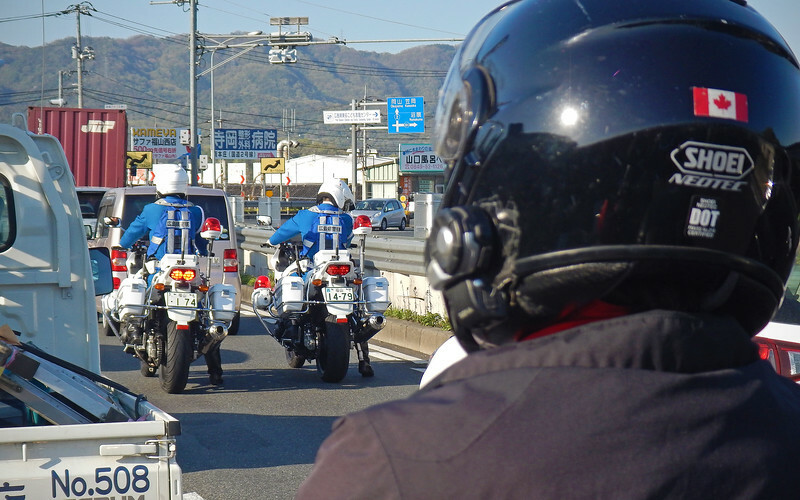 I think they're riding Honda CB1300 Super Fours. We don't get these bikes in North America so I'm not too sure. 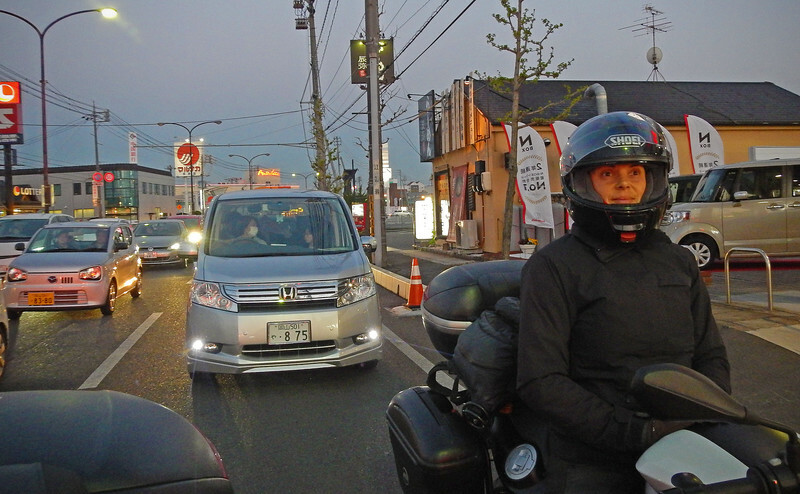 They cut through traffic together and we surreptitiously followed them to try to get a better shot of their bikes! You can tell these guys were well-trained. 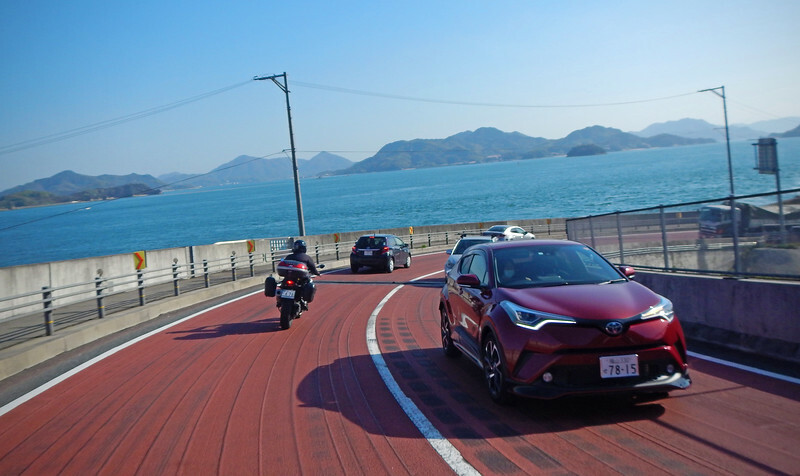 They rode in tandem, shifted and put their foot down in unison. So cool to watch! The crime rate is so low in Japan. Police officers must be the most underworked profession in the country! We find a cheap, non-descript city hotel to spend the night. Tomorrow night, we're done with hotels, hostels and ryokans. Stay tuned!